Naval Hospital Camp Pendleton is a state-of-the-art hospital. 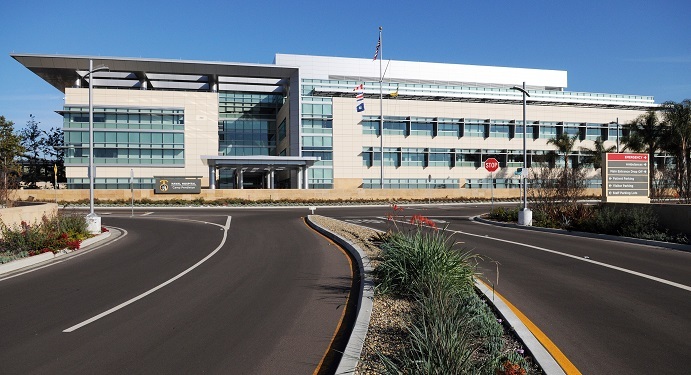 Newly built in 2014, it offers a wide range of services from every day family medicine care clinics, laboratory, emergency services, and more for military service members and their families serving aboard Camp Pendleton. If there is one thing military families are good at, its making babies (especially after deployment *wink wink*). But sometimes that means that labor and delivery beds are completely full, or there is an unforeseen emergency, and you will have to go to an area hospital in order to deliver. This can be a scary realization when it wasn’t in your birth plan, so its best to prepare yourself for alternative plans just in case you need to deliver someplace other than Naval Hospital Camp Pendleton. There are several local area hospitals that are available to moms-to-be who are unexpectedly turned away from NHCP. Local area hospitals include Naval Medical Center San Diego (NMCSD, or Balboa), Scripps Memorial Hospital in La Jolla, and Tri-City Medical Center. Many of these hospitals are more than a 35-minute drive from Naval Hospital Camp Pendleton, not accounting for traffic. For a full list of hospitals in the area with maternity wards, see below. 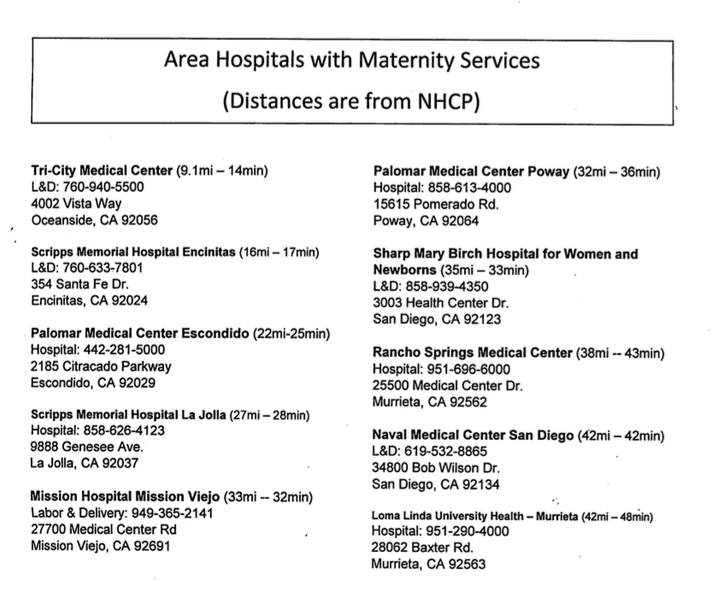 All high-risk pregnancies and those post 41 weeks are asked to go to NMCSD Balboa Labor and Delivery Triage for antenatal (NST/SDP) testing if they cannot gain access to Naval Hospital Camp Pendleton due to an unforeseen emergency or event. It is a good idea to ask to receive a hard copy of your records to take to appointments and any other hospitals (if necessary) at your 36 week appointment. You can pick up a copy of your records at labor and delivery and bring them with you to every appointment, as well as to the local area hospital where you give birth if you cannot access NHCP. All of the patients who are being seen at Naval Hospital Camp Pendleton are on TRICARE Prime, meaning they are required to be seen at that facility unless otherwise referred by their doctor prior to birth. However, Prime patients are also covered for emergency services. Therefore, when you arrive at any local area hospital, you should go through the emergency room to be admitted. They will then transfer you to labor and delivery. 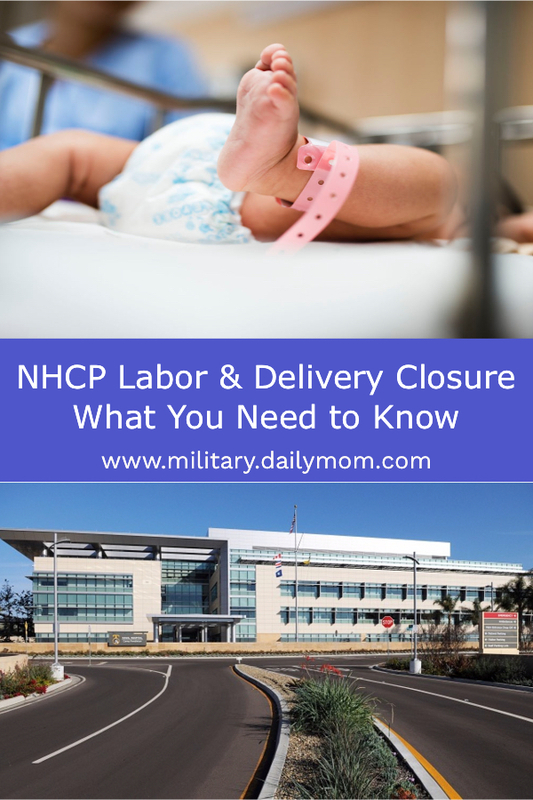 It is also advised to call TRICARE ahead of time and let them know the Naval Hospital at Camp Pendleton is not accepting labor and delivery patients, or that you have to deliver at one of the local area hospitals. It is also a good idea to call Tricare after your baby is born to inform them which hospital you gave birth and that you were either instructed to go there by Naval Hospital Camp Pendleton staff or had to go to a local area hospital due to an emergency. Any care after the baby is born and before the baby and mother are discharged is covered under Tricare Prime, even if mother and baby are discharged at different times. TRICARE will cover any labor and delivery costs, including antibiotics and any testing that is required. The only thing TRICARE does not cover is meals while staying at the hospital. If you are discharged before the baby, but choose to stay longer, your stay will not be covered in terms of meals or postpartum care. It can be scary to hear that the place you planned and imagined giving birth is full. You have taken the tour and planned your birth plan- and now you have to make completely different plans. Hopefully this doesn’t happen to you, but if it does, it is a good idea to have a backup plan just in case. Best Start Birth Center is accepting new clients! Best Start is in network with Tricare Select and Tricare Prime (with referral). Low risk pregnancies are welcome at Best Start Birth Center. 🙂 Located at 3630 Enterprise St., San Diego, CA 92110; right between Pacific Coast Highway and Sport Arena Blvd. Call 619-299-0840 Ext. 4 if you have any questions or would like to set up a tour!